Let our app guide you through the distinctive styles of the classical varietal wines & blends and where they typically come from. 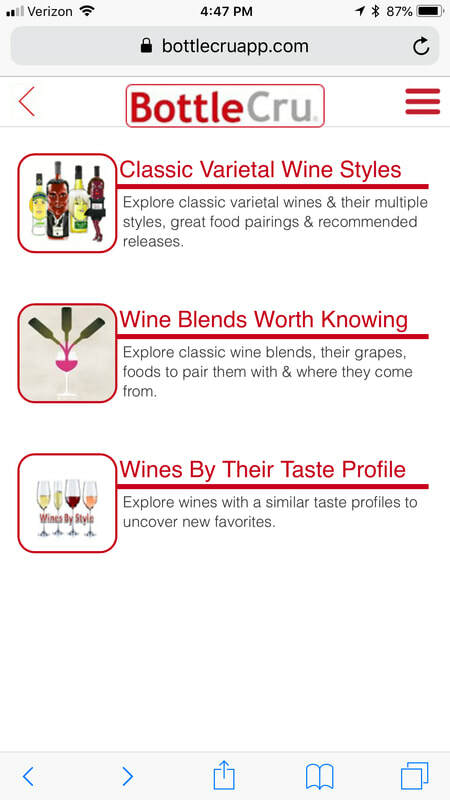 Taste through those wine styles to discover & record your preferences. From then on order and purchase wine in those styles & enjoy them with foods and cheeses that pair best with them! Create and manage a wine inventory of your personal wine collection. Discover new varietals & blends to taste based upon their style profiles. 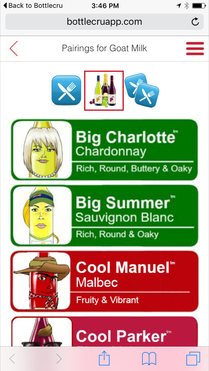 Each wine Classic varietal and Blend in our app is represented by a Vinotar®. For example, Chardonnay's Vinotar is Charlotte. Each also has a number of distinct styles with descriptive nick-names. Charlotte's three are Big Charlotte™, Cool Charlotte™ and Racy Charlotte™. The Vinotars introduce themselves in SipClips™ short animated clips to help you discover and remember their styles. A wine's grape varieties only tells half the story. It’s style ultimately defines its smell and taste! Use the BottleCru app to discover the smell and taste of a wine's different styles, and taste them preferably side by side, to discover your favorites. For an introduction to Charlotte Chardonnay in the app, just Tap Her SipClip Button! Each wine Vinotar® (varietal/blend) in the app has a word-cloud page describing each of its styles. It shows their key overall style character, aroma and taste "markers" for easy recognition and recall. Each also has the style name in bold just above. Each style also has a "style page" with more detail about it. Just TAP on the word-cloud and you'll see its style detail page. In addition, these pages also list regions/appellations that often produce that style. This can help you find wines of a specific style or help confirm that a wine being sold or served to you is in that specific style. It's a very useful tool but not a guarantee of the wine's style, that's what our recommended wines are meant to be. Combining wine with food affects both in complex ways and also is affected by personal taste preferences. But the simple parings typically offered which recommend a base food with a wine, such as chicken with Chardonnay, not only don’t consider your personal taste preferences, but also don't consider several issues which affect the pairing, such as how the chicken is prepared and what other ingredients are in the dish. 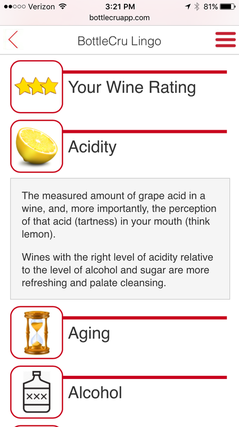 This part of our app starts with each wine style and then recommends several specific complete classic food dishes and cheese parings (listed on the bottom) which have proven to be widely successful with that style. Once you've explored a specific wine style's major attributes, go ahead and taste it. It's truly the only way to learn if you like it. The Recommended Wines features lists wines of a the particular style, indicates where it comes from, its alcohol level and what price range you can expect it to be in. Use the Record A Tasting feature to store reviews of all the wines you taste, not just BottleCru Recommended wines but about 225 wine types, so you can store all your wine experiences in one place. You can also store images of wine labels taken within the app or from the camera role on your smart phone. Go ahead and use voice input for common names, terms and numbers for fill-ins. Put in an Appellation and the app will fill-in its region and country automatically or edit it yourself. ​The My Tasting History™ will maintain a chronological list of those reviews and by tapping on a specific review icon, you can review, edit or delete the tasting. You can also post your reviews on your Facebook page or Twitter account with comments added from right in the app. 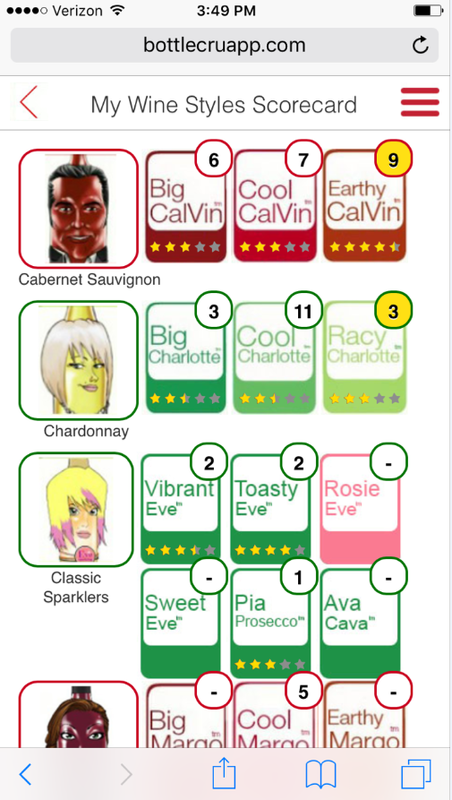 The app automatically creates a Wines Style Scorecard™ that statistically summarizes your tasting reviews (star ratings) of each wine style. It also shows the number of wines of each style you've reviewed and highlights, yellow circles, your favorite style, when you've tasted all of them. Hint: Be sure to try a wine style several times, in order to gain confidence in your style preferences. 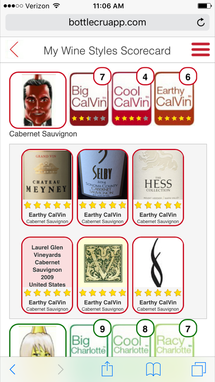 If you tap on a style you will see wines that contributed to that scorecard rating. Zero star rated wines will not be included in style scores as that is meant for flawed wines. Learning to taste like a professional. 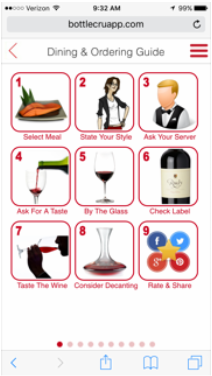 The application has a Tasting guide™ to help you have the best experience when tasting a wine for evaluation. 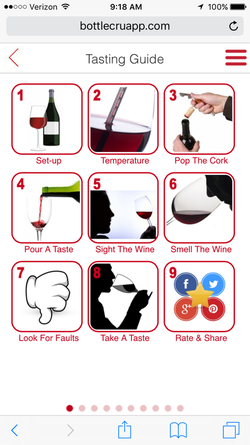 Follow it to have an effective tasting experience when comparing wines. When you have some time, listen to all the recommended steps to follow. Some of them even include insider tips. 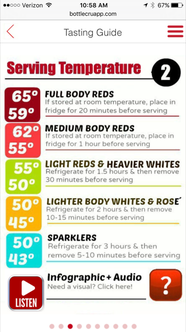 For example, it highlights the effects of temperature on wine. Then when you're actually tasting through wines you can just use the summary screen to remind you of the recommended steps. Finding/Ordering wines in your preferred styles. 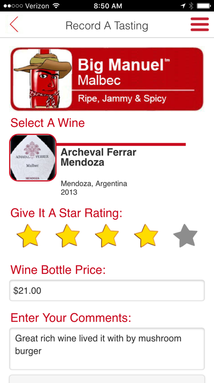 Find wines in your preferred styles and price range in the BottleCru Recommended Wines™ section of the app. This will help you order a wine of your preferred wine styles when you are at a wine store or restaurant. The wines are listed categorized by style, in alphabetical order by Producer name and show the range of average retail prices. The application also provides you style word clouds to help you communicate those styles to servers in wine bars, restaurants and retail shops. These are commonly understood descriptors used by wine professionals, and can help you to easily communicate your preferences. It should help make the whole wine ordering experience simpler, more accurate and less stressful. You can find wines by style or by text search. Just input the wine type, style, producer separated by spaces. You can also select by price if you input dollars signs as a last item on the list. You can also input a wine's region/appellation/country of origin which can strongly suggest a wine is of a particular style. But only the recommendation of a knowledgeable wine professional who has tasted that specific wine release or its inclusion in the BottleCru Recommended Wines listings will guarantee its style. The BottleCru Food Pairing Guide™ starts from the food perspective. 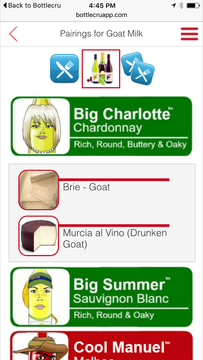 The app recommends specific wine styles to pair with the foods or cheese you select. It lists wine recommendations that have been successful, in order, with the mostly highly recommended listed first. The app is the most comprehensive food pairing app available with 100s of foods & cheeses and 1000s of suggested pairings. 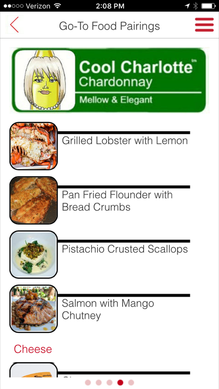 The app groups dishes into major categories which should make finding a dish easy. It includes both major base foods and ethnic groups. It also includes a group of suggested entire menus and wine pairings for special holidays and events. After you select the first dish or cheese you want to pair with, tap on it. The first blue knife & folk "icon" indicates that the app is showing recommenced pairings for that dish. The wine styles are listed in order of our preference, but they are all great parings. So feel free to pick any that best fit your palate and they should pair very well! If you then tap on the wine styles recommended, the app will show you the distinguishing characteristics of those styles and you can also see the appellations that typical produce that style. 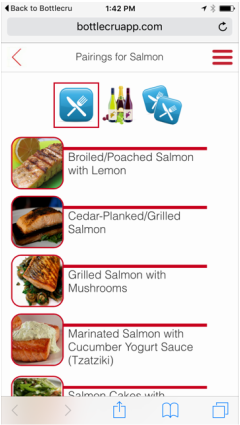 After selecting a meal category, tap on the wine bottles "icon" to see a list of all the wines that pair well with that food category. This allows you to consider a set of different dishes that pair well with a specific wine style, you want to taste or serve. This is especially useful in finding cheeses that pair well with a wine you selected. To find a wine that pairs with two meals, first select the first meal you want to pair, then tap the second blue knife & fork "icon", then find the other meal you want to pair. The app will only list dishes that have recommended wine pairings in common for both dishes. Then tap on the second dish to see the list of recommended wines for both dishes. This makes sharing a single bottle wine easy without sacrificing great wine and food pairing. 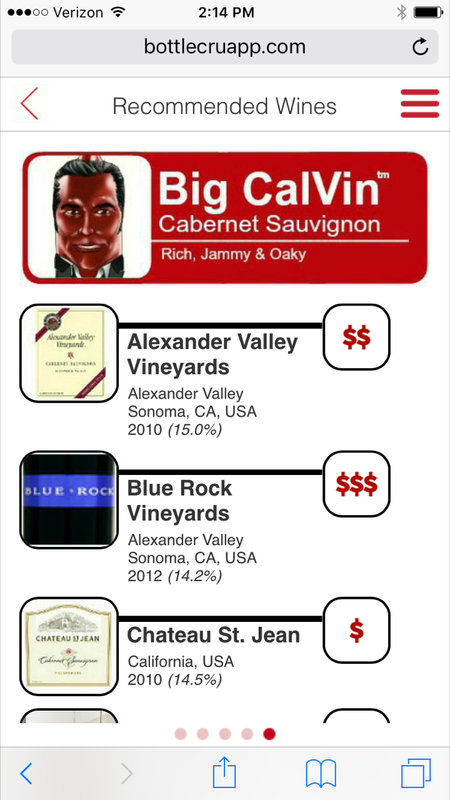 The app makes it easy to create and manage a personal wine inventory. The app allows you to input a : "Best Drinking Window" which is mean to be a range of years to best enjoy the wine, if you know it. The second date is the date by which we strongly recommend you plan to consume the wine, as it has likely reach its peak aging development. The app will remind you by flagging the image of the wine label with a "Sand Clock Image" when that date occurs. If you insert a both a wine type & wine style it can also auto-fill that date for you. But you can delete it or over ride it if you desire. It also possible to Load an Existing Wine Collection you have in another computer application into the BottleCru app. All you need to create a CSV formatted Excel spreadsheet or equivalent in the format of the attached file (first line is a sample input). Send that file to support@bottlecru.com with your contact information. You can then search the inventory using any key words including; Producer, Wine Type, Wine Style, Release Name, Storage Location, Appellation, etc. Even partial key words will bring up the wines that are a match, use quotes for exact matches. If you know you prefer certain wine styles, you can easily find new wines to investigate and taste by starting with wines of similar style. 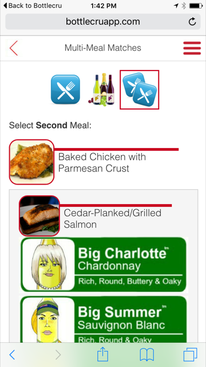 The app provides several Taste Profile to choose from. Including; Sweeter, Sparklers, Reds, White & Pink wine profiles. Some of the terms and vocabulary associated with the world of wine are confusing to new wine consumers. The BottleCru Lingo™ feature explains them. We also explain the meaning of the icons used in the app.